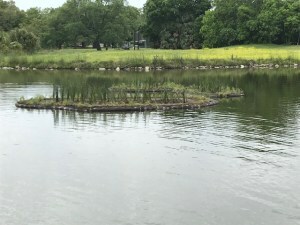 “Our BioHaven® Floating Islands were installed for this project to provide a habitat for wildlife and water fowl living in and around the waterbody. Floating Islands are floating platforms constructed from recycled PET plastic matrix. Vegetation is grown hydroponically to create a picturesque waterscape for lakes and ponds above the water, while the roots are working hard below to remove unwanted pollutants below the water.Thanks to the work these islands are doing, soon you and your children will be able to enjoy the beautiful waterscape and admire the turtles, fish and birds that make their home near the museum.